Can a Long Hair Cat Get a Hair Ball Stuck in Throat? "The high-fiber diet is working. I haven't had hair ball troubles in weeks." Cat parents are familiar with the less than delightful hacking that signifies a hair ball is about to appear. If your cat is long-haired, she's particularly inclined to develop them. The condition is usually just a nuisance for both you and Prissy, but a hair ball caught in the throat is life-threatening. A hair ball can become lodged in your long-haired cat's throat either on the way down or on the trip back up from the tummy. During an aggressive round of grooming, hair can get stuck behind your kitty's soft palate and once there's a little bit there, it has a snowball effect of attracting more and more hair until it's a full-blown hair ball. If too much hair accumulates in your cat's intestines before she passes it one way or the other, the hair ball can grow too big for a successful upchuck and it can get stuck in her throat as she's trying to cough it up. If Prissy gets her long hair stuck in her throat, it could interfere with eating and obstruct her breathing, as well. If your kitty has been coughing and gagging without producing a hair ball, get her in to see the vet right away. It's always wise to consult an experienced veterinarian regarding the health and treatment of your cat. This is especially true when she is having trouble breathing or displaying other signs that something is caught in her throat, such as drooling and keeping her mouth open. Your vet can determine whether surgery is necessary to remove the blockage. Preventing hair balls is far better than having to deal with one stuck in your cat's throat. 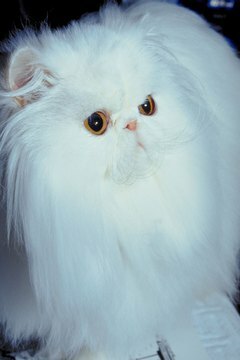 Long-haired cats should be brushed every day and then wiped down with a damp cloth. This will remove as much loose hair as possible before your cat has a chance to swallow any during self-grooming. Feed Prissy a kitty kibble that is 3.5 to 10 percent fiber to keep things (including hair) moving through the digestive tract and out the proper end. You can also give your long-haired cat about 1/4 teaspoon of petroleum jelly or even a bit of butter once a week to keep things running smooth. If your long-haired kitty is a compulsive groomer, it can aggravate her already increased tendency to develop hair balls and increase the chances that one could become stuck in her throat. Discouraging overgrooming will bring those odds back down to a manageable level. Redirect Prissy's attention when you see her grooming by initiating some play time. Dangle a toy or roll a ball -- whatever will distract her from grooming. You can also use noise to interrupt excessive grooming, something like a clicker, whistle or even just clapping your hands. If Prissy's overgrooming is a reaction to stress, take steps to make her feel more comfortable and secure. Providing her with a private place to hide or escape and getting her her own litter box, food and water dishes (if you have more than one cat) will put Prissy at ease and reduce the probability of cultivating throat-blocking hair balls. Planet Cat: A CAT-alog; Arden Moore et al. Does a Chocolate Labrador Have White Hair?